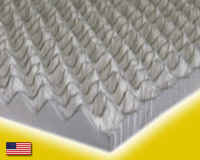 Our egg crate Natural Latex mattress topper is the perfect way to soften up a hard mattress. They can be set on top of a mattress either fingers facing up or down, your choice of comfort. Our latex is certified 100% natural rubber. You've never felt anything like this! The egg crate Natural Latex Mattress Topper does not have elastic bands or some other scheme to keep it in place. Gravity and the fitted sheet does the job. Please remember to add another 2 1/2 inches to your fitted sheet depth to accommodate the egg crate topper. Our egg crate Natural Latex mattress topper, being sealed up tight, sometimes causes the scent of these products to concentrate to a disagreeable level. A few hours of airing usually removes the odor, several days is best. Larger sizes are made with seams which are as strong or stronger than the pad itself. OPTIONAL COTTON COVER: HIGHLY RECOMMENDED! Latex Foam toppers are magnets for dust and dirt, and tear easily. Our cotton covers are custom sewn to completely encase your foam topper order. These are highly recommended to protect your foam from staining or tearing. The covers are made of soft 100% cotton, and have a deluxe satin finish. All covers have a zipper so that they can be easily removed and dry-cleaned. Please note that these covers should be dry-cleaned only. We cannot accept returns on shrunken covers. The natural degradation of Natural Sense toppers is slowed with a cotton cover. The less air flow, the slower it will dry out. RETURN AND CANCELLATION POLICY: Please note that these Latex Mattress Toppers are custom cut for you when you order. We do this so we can offer many custom sizes.Because our bedding is custom for your order, please order carefully. Cancellation of an order is generally impossible as we start production ASAP. We can only accept returns within 30 days of order, a 50% re-stock fee will apply, and the bedding must be un-opened and in original packaging. Bedding that has been used or washed is not returnable. Please note that you are responsible for all shipping costs. The Full XL Size Egg Crate Natural Latex Mattress Topper 2" Thick is made with 100% natural latex.